Excel SEO Keyword Analysis (IntelSearchXL) is an Excel add-in with stepwise technical functions dedicated to the analysis of search engine rankings for keyword and phrase combinations. Customization options enable the keyword analysis to align with existing or desired SEO strategy structures to enhance online marketing profitability. Intuitive stepwise interface with specification of options to undertake targeted analysis. 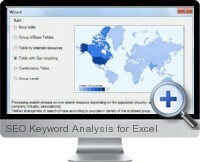 Access from a collection of technical functions to create customized keyword and phrase ranking analysis. Process grouped combinations of search phrases for one search engine with filtering analysis to define optimal strategies. Analyze cross referenced landing sources with keyword combinations to quickly isolate the most optimal phase and landing page combination for a single search engine. Process multiple keyword phrases across multiple search engine resources to isolate hotspots and weaknesses across internet search resources. Analysis reach for search phrases in one search engine based on geographic population at granular demographic levels including country, region, state, city and district as well as industry and company. Recursive process of a single search phase versus alternative search phrases on one search engine to analyze quantify SEO relative impact. Multidimensional reporting of multiple search keywords and phrases to accompanying terms within one search engine to isolate optimal combinations for a specific product or subject text. Applicable to a wide range of SEO strategies such as marketing and competitive intelligence, web analytics and product placement research.